With the recent marriage of Prince William to Kate Middleton, Prince William’s late mother and her sense of fashion have been in the news more than ever. Kate Middleton was given Lady Diana Spencer’s 18-carat oval sapphire engagement ring that is surrounded by brilliant diamonds. Originally, Diana had chosen this particular engagement ring after several had been shown to her in 1981. Her choice at the time was quite the scandal. Many, including some in the royal family, were dismayed that Diana had selected a ring that any commoner could buy, rather than having it custom-made. Her diamond and sapphire ring, at the time, cost $60,000. The “commoner’s sapphire” has been attached to her name ever since. Regardless of their judgment, Princess Diana loved this ring and wore it even after her divorce from Princes Charles. Many wonder today how Lady Diana’s style would have progressed and changed over the years. It is safe to say that her love for the blue sapphire would have continued and her style would have merely become more modern, but remained elegant. Diana always had an interest of being close to the regular, every day people and most likely she would have still reflected this in her clothing and jewelry choices. This dazzling diamond and sapphire eternity ring would have made an amazing addition to Princess Diana’s already iconic jewelry collection. Today, one of the most popular pieces of jewelry is the diamond eternity ring. Diana may have put her own personal spin on this amazing piece of jewelry by choosing to wear a diamond and sapphire eternity ring. 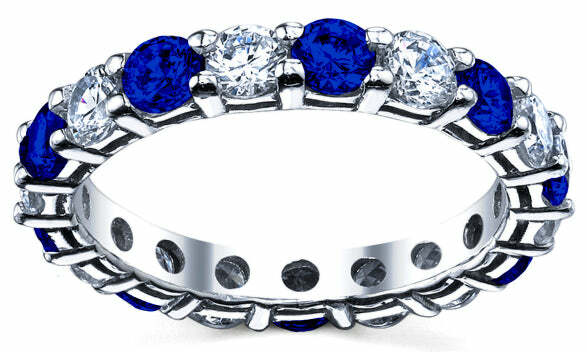 People would have admired her brilliant blue sapphires and diamonds eternity band. These diamond and colored gemstone eternity rings are fun, modern, and yet completely sophisticated. Any person, royal or not, would cherish one of these amazing eternity rings.